Morrow County Hospital Emergency Department is staffed 24 hours a day, seven days a week, with physicians and nurses who are specially trained to respond to medical emergencies and potentially life-threatening situations. Our emergency services are designed to meet all medical and surgical emergencies that may arise. EMS personnel are able to communicate with our physicians and hospital staff prior to your actual arrival. If you think someone has been poisoned, contact the Poison Control Center at 1 (800) 222.1222. Know what allergies you have. Know what medications you are currently taking. Every second counts when a stroke occurs. Receiving the right care as quickly as possible can make a remarkable difference in a person’s quality of life after a stroke event. Morrow County Hospital is a member of the OhioHealth Stroke Network, bringing expert stroke care to our community and providing stroke patients with the best possible outcomes. The OhioHealth Stroke Network uses advanced, virtual health technology to connect the emergency team at Morrow County Hospital with OhioHealth stroke specialists in Columbus. OhioHealth stroke specialists use two-way audio-visual technology that virtually puts them in the room, helping our local physicians and nurses make the time-critical decisions that save lives. A patient requiring additional medical attention may be transferred to an OhioHealth Comprehensive Stroke Center or Primary Stroke Center. Quick, expert treatment can prevent long-term disability, so it’s important to understand the warning signs and symptoms. 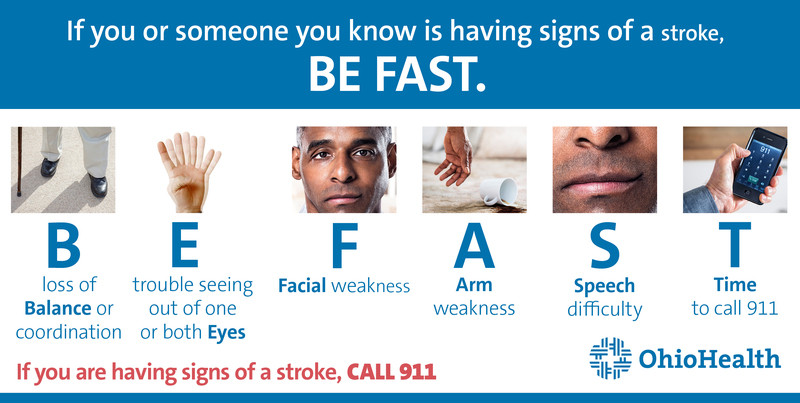 If you or someone you’re with experiences any of the following symptoms, call 9-1-1 immediately and tell the dispatcher you suspect a stroke.